Part of the Gothamist network of city blogs, SFist covers local news, food, art, entertainment and events for San Franciscans. 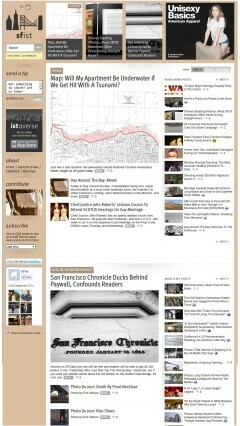 Like the other Gothamist sites, SFist has a magazine style front page that uses responsive design techniques to adapt on the fly to all screen sizes from mobile (left image) to PC (right image). It’s one of the few responsive magazine style designs I’ve seen and it works well and looks good on the desktop and in the Android browser and Opera Mini. However page loading is a bit sluggish with the Android browser thanks to the 4.3 MB page weight. I’m also not a fan of the 300 x 250 px desktop banner add that dominates the page above the fold on mobile devices. This entry was posted in City Guides and tagged mobile site review, Responsive by Dennis Bournique. Bookmark the permalink.